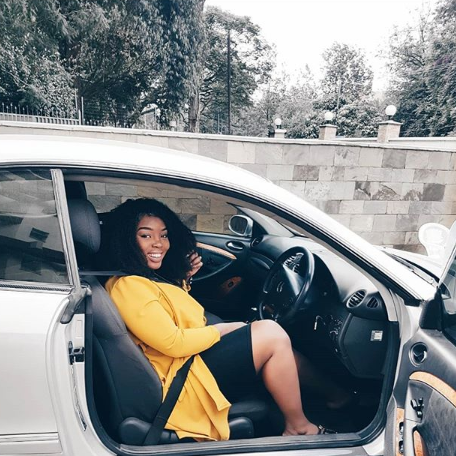 Former Nairobi Diaries actress Risper Faith is one lucky lady after acquiring a brand new car. The socialite, who is now married to Brian Muiruri, has acquired a brand new Mercedes C200 Kompressor which goes for almost Ksh 3 million. Her hubby drives a Mercedes Benz Van worth almost Ksh 3.2 Million. Faith took to social media to floss the brand new car as they were getting cleaned. The two have now been married for almost half an year. Faith confessed that he fell for him because of his money. “Frankly speaking, at first I was attracted to the money and all that lifestyle thing. Every girl likes that. But with time I got to learn his character and saw him from a different perspective. Brian is a great man who besides the money takes care of me.” she said in an interview a while back.